To avoid any delays, please strictly follow these recommendations for sampling. 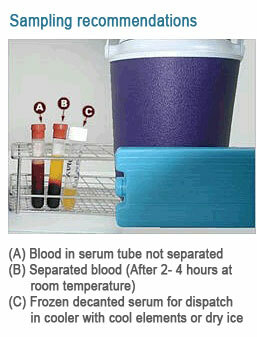 Use proper vacutainer tubes from CVRL or vacutainer from Becton Dickinson UK Cat. No. 368430. Other tube types do not fit in our centrifuges. After taking blood from the jugular vein, the blood in the tubes has to settle. Keep the tubes at room temperature for at least 2 hours. During this time, the serum will separate from the blood clot. Do not freeze or refrigerate the blood during this period. If the tubes can reach CVRL within 2 to 4 hours after the initial settling of the blood, send them without centrifugation and without decanting the serum into new tubes. However, the tubes must be kept at +4°C (not frozen) and reach CVRL in a cool container. If the blood has to be sent to CVRL by courier, the vacutainer tubes that have been kept at room temperature must be centrifuged, and the serum (without any traces of blood) poured into new tubes. To avoid leakage, the tubes should be made of plastic and should be tightly sealed with a lid and paraffin tape. The serum must reach CVRL frozen! Please submit at least 7 ml of serum. A completed requisition form signed by an acknowledged veterinarian must accompany all despatched blood/sera. The forms can be obtained from CVRL or downloaded from this site. Do not send samples to CVRL at weekends or on any other festive holidays. CVRL working days are from Sunday to Thursday from 08h00 (8am) to 16h00 (4pm). Results will only be released when payment is settled. They will be published on the website or emailed to you. They can also be posted to you upon request. Online Credit Card payment is available in our portal. Please register for availing this facility. It is crucial to send samples to CVRL at least 14 days before the import/export of the horse and vital that your fax is working. Samples: Swabs in Amies transport media with charcoal. Site of Sampling: Commonly prescribed site: Mares - cervix, uterus, clittoral fossa, clittoral sinuses; Stallions -urethra, urethral fossa and diverticulum, prepuce, pre-ejaculatory fluid. Time of collection: Antibiotic treatment for whatever cause should cease at least 7 days for systemic treatment and 21 days for local treatment before swabbing. Transportation: Swabs must be transported cool and must reach CVRL not later than 48 hours after collection; recommended is 36 hours. Swabs in Amies transport media with charcoal can be purchased from CVRL by prior arrangement. Date and time of collection of the samples should be mentioned on the requisition form. Site of Sampling: Naso pharyngeal, direct from freshly burst abscess, Guttural pouch lavage. Transportation: Swabs must be transported cool and must reach CVRL not later than 36 hours after collection; Preferably as soon as possible. Swabs with Amie's transport medium can be purchased from CVRL by prior arrangement. Please refrain from telephoning CVRL for results. Results will be available after the duration specified for the test and when payment has been received. *** CVRL will not release the results until payment is finalized.